How do you carry oversized aircraft components or a whole airplane? How to deliver space vehicles or a satellite to their launch site? Volga-Dnepr Group offers a unique "Cargo Supermarket" service that allows us to deliver the most suitable and cost-efficient transport solution for every piece of your cargo. We aim to respond within 15 minutes upon the receipt of your query. 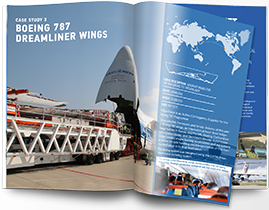 A fleet of 12 An-124-100 freighters, the world’s largest series-produced cargo aircraft. The extraordinary size of the An-124-100 ‘Ruslan’ cargo cabin allows the carriage not only of such big aircraft parts as wings, but also whole fuselages of mid-size aircraft and heavy helicopters. 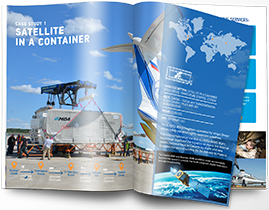 Thanks to the unique capabilities of its fleet and loading and discharge equipment developed by the company, the transportation of space equipment can be accomplished without disassembling the shipment or any additional preparations. For airlines and aircraft maintenance suppliers, Volga-Dnepr regularly transports spare parts, components and aircraft engines to MRO facilities around the world. 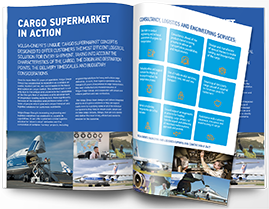 Since 1990, the world's leading suppliers of air transport and space equipment, state aerospace agencies, helicopter companies and aircraft operators have entrusted Volga-Dnepr with their most important and complex supply chain challenges. 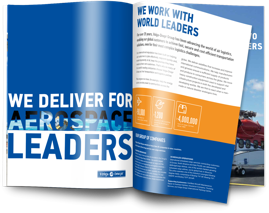 With proven experience supporting space exploration missions and delivering sensitive satellite technology for leading space agencies, Volga-Dnepr’s unrivalled capabilities guarantees the safe delivery of your cargo. Volga-Dnepr has transported for some of the leading names in helicopter manufacturing with our An-124-100 being able to accommodate 4 MI-8 or MI-17, 3 Super Puma, or 5 AH-64 to name a few. Since 1990, the aerospace industry has represented one of Volga-Dnepr group's biggest customer sectors. Two IL-76TD-90VD freighters safely delivered highly-sensitive satellites (930Kb). If you have your own instructions for the transportation of your helicopter model, please send these to us for approval prior to shipment. All closed space, such as fuel tanks, etc, must not be hermetically sealed in order to equalize the air pressure inside and outside of them during the flight. Confirm with the airline how the helicopters are going to be transported, including which parts of the helicopters are to be dismantled and how to pack the dismantled parts. If you are planning to place an additional partof the cargo in the helicopter cabin, secure it in accordance with the maximum flight overloads in order to avoid damage of the cargo. Notify the company regarding this, specifying the weight of the additional piece, in order for the company to be able to complete the load planning and navigational calculations. Information regarding the maximum operating loads is provided to the customer in Appendix 2 of the charter contract. If required, this information can be provided separately. Supply information on any dangerous goods that form part of the cargo. Inform the airline if you have special requirements for the transportation (air temperature and pressure in the cargo cabin). During the flight, the pressure in the cargo cabin is lower. The air pressure in the cargo cabin of the An-124-100 transport aircraft may be reduced to 250 mbar. 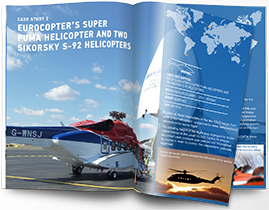 Provide the airline with an accurate list of any additional load to be sent with the helicopter. This is required for load planning. Inform the airline about which components can be used for mooring helicopters. The airline will send you the provisional mooring scheme for approval. The airline will ask you to approve its planned use of technology for loading and transportation. Please review it and either give consent or explain the reasons for any questions you have and everything possible will be done to find a solution. Talk to the airline if you have any questions or concerns. Solving issues during the preparation stage will avoid any problems or delays during the actual transportation. For the most effective transportation of aircraft parts, such as the fuselage, wings and stabilizers, it is advisable to involve Volga-Dnepr at the design stage. The airline will offer technical and logistics solutions for transportation and confirm the transportation methods. The load must be equipped with appropriate rigging and mooring sites. Cargo and its packaging must be capable of sustaining all maximum operating conditions during flight. All confined spaces must have a connection with the environment to equalize the air pressure inside and outside of them in order to avoid damage. Provide a complete list of the goods to be transported, showing the individual weight and size of each item. Packaging must comply with the airline’s requirements. When transporting aero engines, provide the engine drawings on the transport frame to be used. Provide a list of any hazardous goods that form part of the shipment, indicating the UN number. Contact the airline to discuss transportation ahead of the design phase of the special containers or other transport devices to be used for the shipment. Supply drawings of your cargo to the airline and confirm the required conditions of carriage. The airline will offer the most suitable type of aircraft and the best technical and logistics solutions. The airline will propose the method of loading and confirm the requirements for preparing the cargo. The optimum, most mutually acceptable solution will be determined in the design phase. Notify the airline of the presence of any substances or items classified as dangerous goods that form part of your shipment. Change of pressure during air transportation must be considered in the preparation of the cargo. The airline will answer all customer questions relating to the conditions of carriage.